Following the loss suffered from the arson attack earlier in the year it was decided by the Trust and Friends of the Navigation to apply for a grant from the Welsh Church Fund via Caerphilly County Borough Council. We are pleased to report that the application has been successful. As luck would have it we also had the opportunity at the same time to purchase two shipping containers at a very reasonable cost. 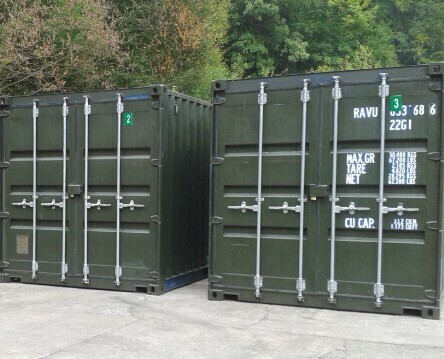 These two containers were recently brought to the site by M & J Plant and Transport Ltd of New Tredegar and have been placed to the rear of the Power House. We are also indebted to Jon Tillott of Tillott Renewable Contracting who has supplied a third container for our use, along with several items of equipment. 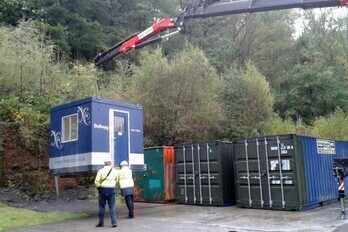 Once again M & J Plant and Transport Ltd were kind enough to collect this container and deliver it to site. 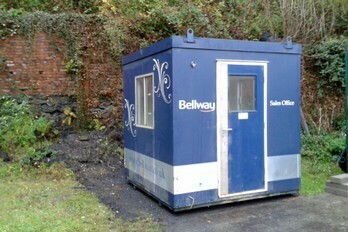 A fourth unit has also been obtained and we are extremely grateful for a very kind donation from Bellway Homes of a unit they no longer required. This was delivered to site on Friday 12th October by R E Plant Hire Ltd. These new additions provide a more secure storage facility and also a small workshop for our volunteers to carry out tasks in the dry when the weather is against us! Just click on the picture, left, to visit their website for details of new homes in your area !